Low Power Wide Area Networks (LP-WANs) are an emerging platform which allows low cost (<$5) and low power devices (e.g. with a 10 year battery) to communicate at low bit rates (a few kbps) over long distances (up to 10km in rural areas) to a base station. LP-WAN devices have the potential to be the building blocks in the context of IoT to provide solutions such as smart infrastructure, smart homes and smart vehicles. The authors envision a future where many low power battery operated devices are deployed in urban settings to gather sensor data and send this data to a few LP-WAN sinks. However in such large urban environments, use of LP-WANs faces challenges in terms of interference and transmission range. Dense deployment of LP-WAN nodes in an area can result in interference between their radio signals (due to current MAC protocols) requiring retransmissions that will drain the battery life quickly. The second challenge is that an urban environment consists of multiple buildings and other obstacles that cause signal attenuation between the LP-WAN node and the sink greatly reducing the node effective transmission range. The authors present Choir as a solution to address the interference and transmission range challenges and is focussed on achieving three objectives; providing a scalable solution, extending the range of the nodes and preserving simplicity. Their solution which is implemented on a LoRaWAN base station does not require hardware modification to the LP-WAN sensors. LoRaWAN base stations are used because they use chirps for transmission and data is encoded in a chirp by changing the initial frequency. Choir addresses the interference and range challenges in the following manner. 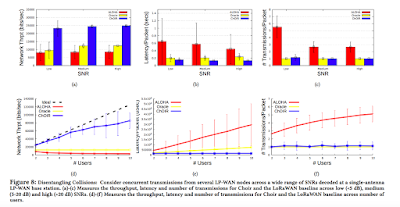 To address the interference challenge, the authors exploit the hardware imperfections of the radio components in the LP-WAN nodes. Due to the hardware perfections in an LP-WAN node, it transmits a signal (in the form of chirps) that is offset in time, frequency and phase. Choir receives the signal, separates the data from the hardware offsets, then by using the frequency offset values, it identifies the data belonging to individual clients. 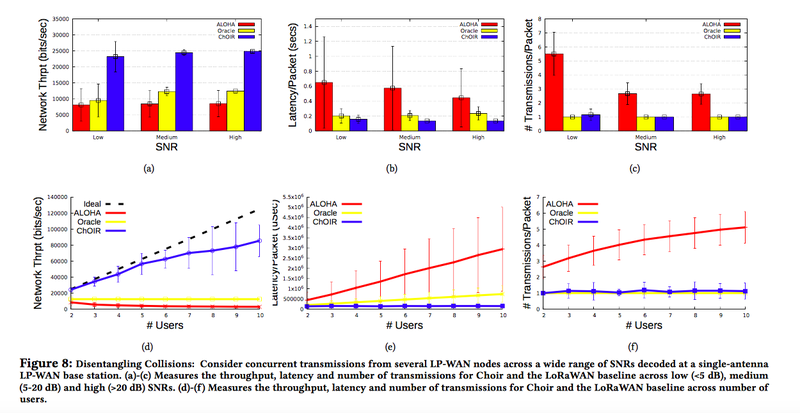 Since Choir does this simultaneously for multiple nodes, it removes the need for retransmissions, thus improving the throughput, reducing latency and extending the battery life. To address the range challenge, Choir allows co-located sensors which individually are far away from the base station to collaborate and transmit overlapping chunks of bits concurrently as overlapping chunks of signals. This boosts the sending signal allowing it to percolate the noise floor and reach the base station. - the communication range expanded by 2.65x. 1. Question: Since sensors can be located on human bodies or moving objects which have random motion, this creates the Doppler shift effect i.e. random frequency changes. How does your solution deal with this? Answer: The Choir solution uses the fractional component of the frequency offsets to identify collisions between multiple users. However if this offset keeps changing for a given user, it will be difficult for the Choir solution to work. 2. Question: If two bits of data received at the base station with a very small difference between them (in terms of frequency and timing offset), how does Choir handle this? Answer: If the difference between the frequency and timing offsets is too small, Choir cannot differentiate the two peaks received. 3. Question: Please clarify why you do not use one initial fixed frequency for all transmissions? Answer: Choir uses LP-WAN PHY which encodes information in form of chirps and different bits are encoded by initiating the chirps at different frequencies. 4. Question: One of your key underlying assumptions is that different radios have unique underlying imperfections. Have you studied to what extent this is true? Answer: From our experiments we have seen that hardware imperfections are diverse however sometimes with a large number of nodes the differences in hardware imperfections in some nodes are not distinct enough to differentiate the chirps and this leads to leveling out of performance improvements. 5. Question: LoRaWAN can be used with many channels, why have you only used one channel? Answer: LoRaWAN uses chirp spread spectrum and divides chirps in time using CDMA, TDMA or Aloha. Choir uses only 1 channel because use additional channels requires scheduling at the base station between the nodes. However performance of Choir would be improved by use of the additional channels.